More than 700 tons of sand was trucked in from northern Italy. The Vatican unveiled its novel Nativity scene for Christmas in St. Peter’s Square Friday afternoon -- sculpted completely out of sand for the first time. The traditional scene depicting Joseph, Mary and the infant Jesus surrounded by angels, shepherds, animals and the Three Wise Men was made with over 700 tons of sand and is about 82 square feet. (Phoebe Natanson/ABC News) The sand sculpture nativity scene is unveiled at the Vatican, Dec. 7, 2018. The sand comes from Jesolo, a resort town near Venice. It was taken from an inland area -- more compactable than seaside sand -- and brought to the Vatican last month. 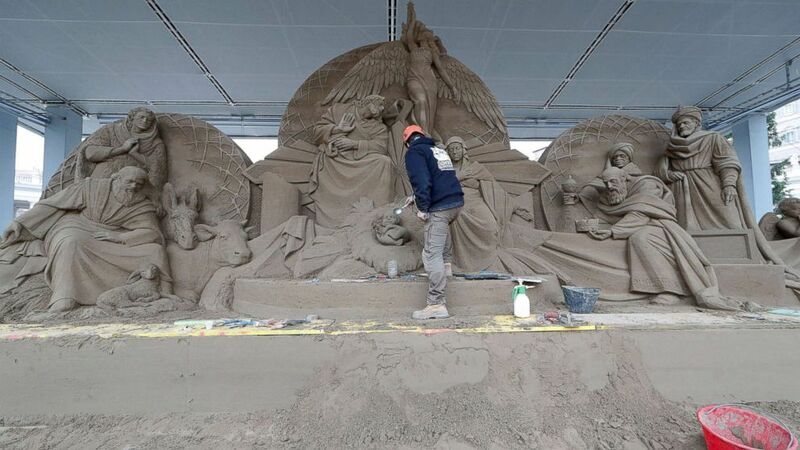 Three sand artists from Russia, Holland and the Czech Republic, working under the direction of Rich Varano, an American professional sand artist, sculpted the Nativity scene. The artists worked on site for weeks behind a screen to prevent people from seeing the scene before it was finished. (Alessandro Bianchi/Reuters) An artist works on a sand sculpture representing baby Jesus as a part of nativity scene in St. Peter's square at the Vatican, Dec. 6, 2018. 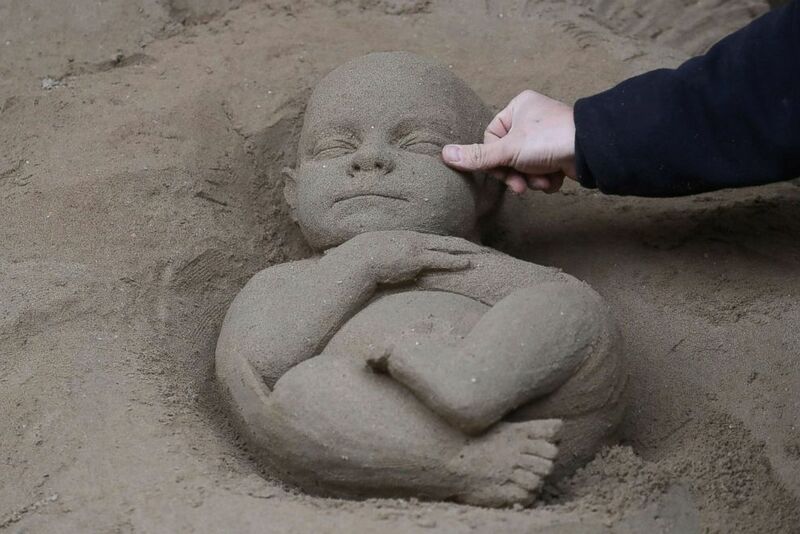 Varano, who has been making sand sculptures for decades and spends a great part of his time working in Italy, had never been to Rome or the Vatican. (Alessandro Bianchi/Reuters) An artist works on a sand sculpture representing part of nativity scene in St. Peter's square at the Vatican, Dec. 6, 2018. "It is a spectacularly wonderful experience, nothing like I could have ever done in 30 years of business, to be here surrounded by such a rich culture, history and the art from the masters," he said. "It's a very humbling and emotional experience." The Nativity scene is by the obelisk at the center of St. Peter’s square next to the decorated large Christmas tree. It will have a canopy covering it to protect it from the rain and plastic curtains for use in case of bad winds and storms. (Tiziana Fabi/AFP/Getty Images) A detail of the sand nativity scene at Piazza San Pietro in The Vatican, Dec. 6, 2018. 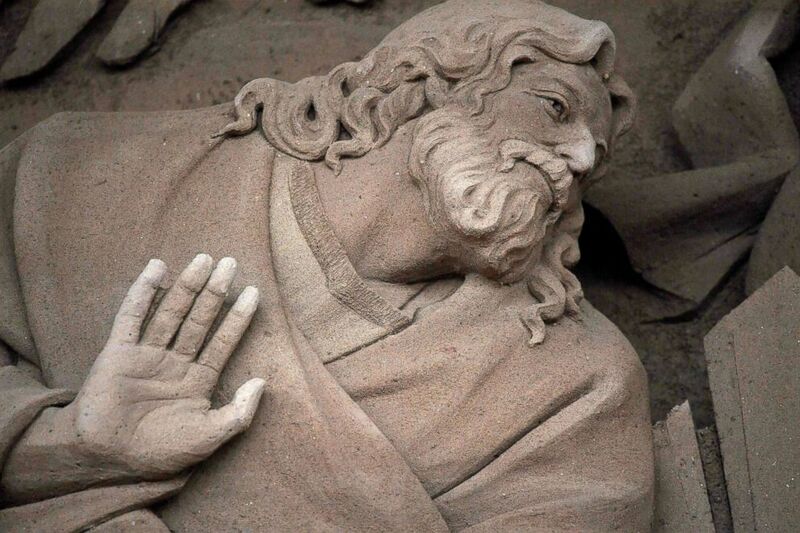 The Nativity Scene at the Vatican is built from sand and sculpted by international artists. Pilgrims, tourists and Romans traditionally flock to the square during Christmas to see the Nativity scene. It will remain there until January 7, after which the sand will be returned to where it came from. 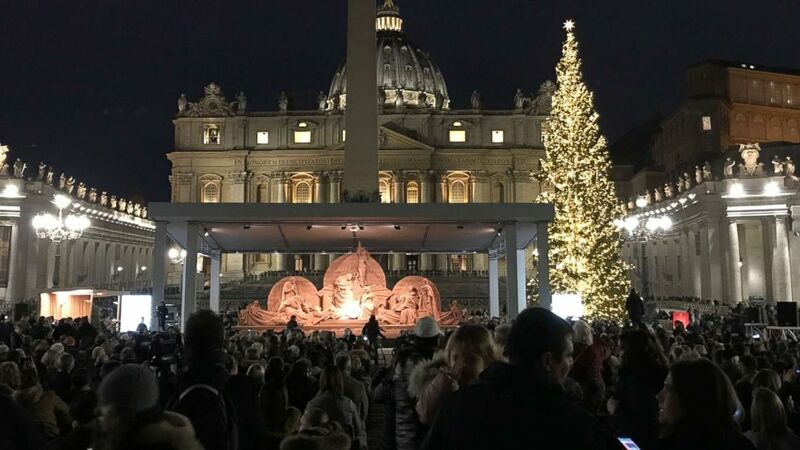 Pope Francis, in thanking sponsors for the Christmas tree and the Nativity scene, said Friday that the sand is "a poor material, recalls the simplicity, the smallness with which God revealed himself with the birth of Jesus in the precariousness of Bethlehem." The pope will visit and bless the Nativity scene on December 31.